The subject for this painting was ordered by a collector of the Tropical series. Like many beach lovers who visit Hawaii, she enjoyed long pleasant days on Waikiki beach. Diamond Head crater can be seen in the distance. If you visit Oahu and have stamina for climbing, it's a nice hike up to the top of the crater from which there are excellent views. I, for one, was glad that I'd kept in shape all winter by climbing up and down the stairs in my home 10-20 times per day because once we got to Diamond Head, the stairs to the top seemed unending! 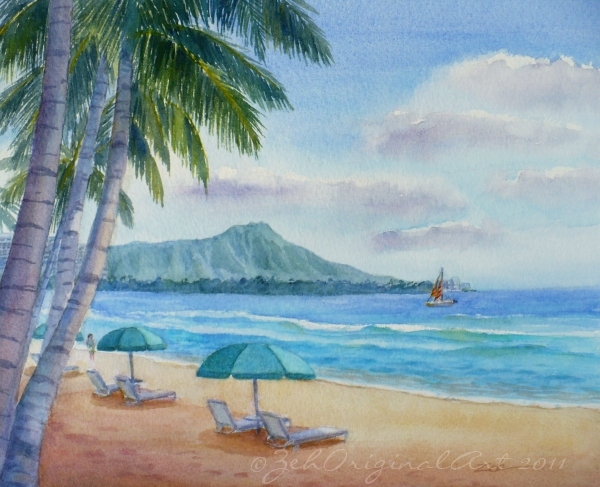 See more of my Hawaii seascapes.